The Little Purrince Shimshi here - Master of the Queen's Mischiefs! You're all dying to hear more about Moo's adventures, aren't you? 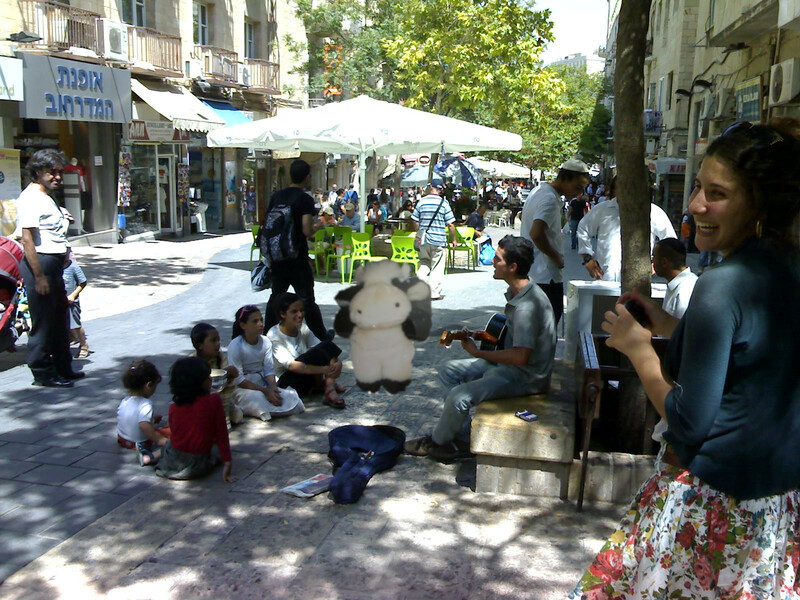 Moo was furry keen to see what effurryday life was like in the streets of Jerusalem, so earlier this week, We took her downtown, to "The Triangle". This is a spot in the centre of town bordered by Jaffa Road, King George V Street and Ben-Yehuda Street. These used to be the three main streets of Jerusalem, back in the Bad Old Days when Jerusalem was divided between Israel and Jordan. We have heard that in those days, what is now a modern Capital city was a sleepy, provincial-like town. But now, the Triangle is a bustling pedestrian precinct, with lots of shops - many of which cater mainly to tourists - cafes, restaurants and pubs. 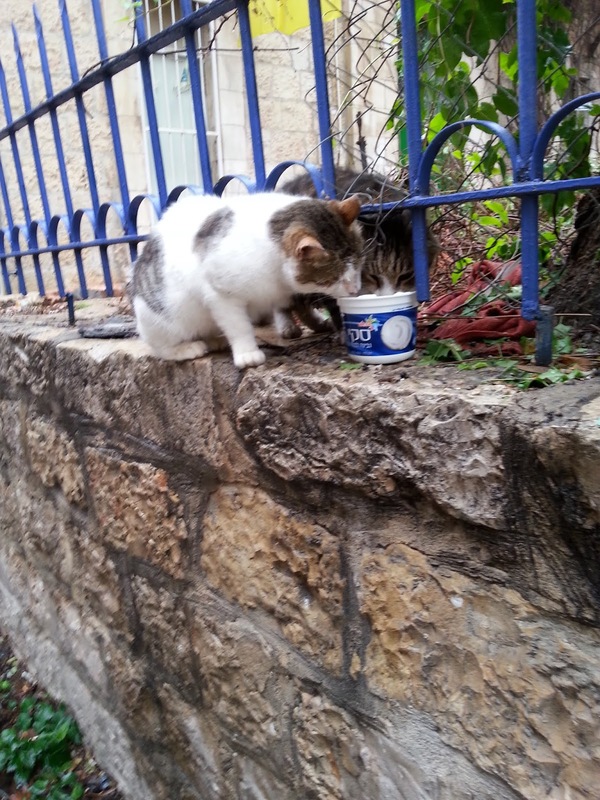 What's more, it's a popular spot for street mewsicians, like the one in the picture below. The Triangle includes many little sidestreets and narrow lanes. In some of them, there are private houses and even synagogues. One of these is Yavetz Street, a little lane known to Jerusalem residents as "Bahari Alley", because it has been home since the 1960s to the Bahari family's famous shop selling pitzuchim (פיצוחים) - one of those untranslateable Hebrew slang words meaning nuts and seeds, such as pumpkin, watermelon or sunflower seeds. At one time, there used to be two such shops belonging to the Bahari family, in the same short, narrow street - due to a quarrel between two of the brothers, who could not get on with each other. Anyway, in this little alleyway, We met these sweet kitties, who were sharing a tub of cottage cheese put out for them by one of the residents of the street. We stopped for a chat with them and asked them for suggestions where to take Moo next. They thought Moo might be interested in the Italian Mewseum and synagogue in Hillel Street, just a short walk away. I didn't really want to see another mewseum, but Moo and Trixie liked the idea and Caspurr is so easy-going, he didn't really mind where We went, so that was decided. Mummy knows the Mewseum and synagogue well, because She has several times purrformed there with her Caterwauling Club. Outside the Mewseum, We met the Guardian, Laila. 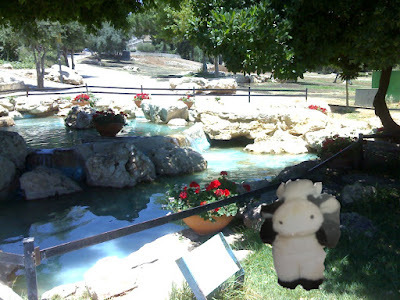 We explained to her who Moo was and what she was doing in Jerusalem. Laila wasn't in the least bit surprised. It turns out that she knows Cleopatra, whom We met at the Israel Mewseum earlier this week, furry well indeed. She and Cleopatra are both on the Mewseum Cats Committee and Cleopatra had already told her about Moo. So she had been expecting Us and was furry happy to give Moo a purrsonal, guided tour - the highlight of which was the beautiful synagogue. The synagogue was originally located in Conegliano Veneto and after the Second World War, it was transported to Israel and reconstructed in Jerusalem, where, as well as being a part of the mewseum, it is also in regular weekly use by the Italian Jewish Community of Jerusalem! 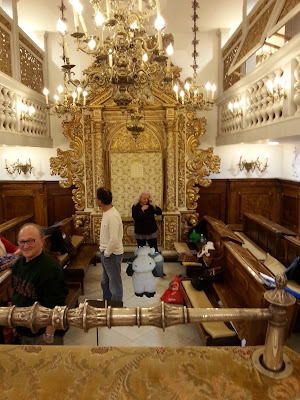 Here is a picture of Moo, in front of the Ark of the synagogue. After our guided tour, We decided to take Moo to Independence Park. To get there, we crossed what is popularly known as "Cats' Square" (כיכר החתולות - Kikar Hachatulot). Nobody seems to know what its real name is. Mummy had to look it up. Officially, it is called Maccabi Motsri Square, after a Palmach commander who was killed in Israel's War of Independence. Why it's called "Cats' Square" is also something of a mystery. 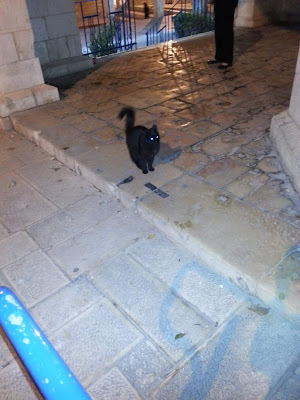 It might be because there is a large cat population in the area, due to the many restaurants and eateries in the surrounding streets. But some people say it is because before the neighbourhood was cleaned up and gentrified, there used to be a lot of not furry respectable ladies working there, and the local residents referred to them as "cats". Anyway, as I said, We took Moo to the park and she enjoyed grazing on the grass there, while We had a pleasant rest in the shade under the trees by one of the pools. After We had rested, it was time to head back home, where, after a snack or two, We were all of Us (#MooToo) in need of a nap. It seems that Moo is always on the moove. But all those shots are stills. Doesn't moo want to be in the (say it with me) moovies? What a fun time Moo is having! How cool that Moo is there! It looks like she went to lots of places that I went to on my visits to Jerusalem! It has been nice reading about your Special Visitor! We had a Hippo visit us once. WOW!!!! I love seeing everywhere you all took Moo while she is there. I wish I had tagged along because this is a bucket trip if there ever was one! Imagine being in the synagog and see the Ark. Never mind all the rest. Ask mommy to tell us sometime of all the Synagogs have Arks? And who tends them? Is it as in Biblical times int at someone is designated to care for it? Mom just whispered to me that she should look that up for goodness sake.